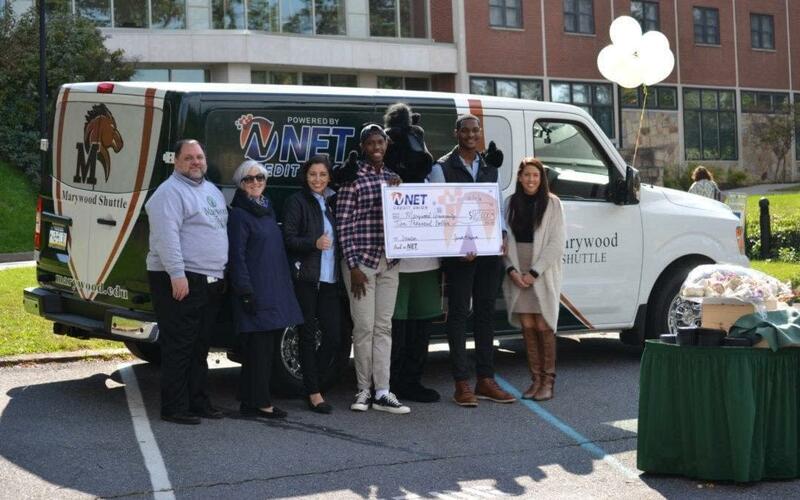 Scranton, PA October 22, 2018 – Marywood University students now have a reliable, cost-efficient mode of transportation thanks to two current students, Kendall Farrell and Dimitri Thompson. The two students thought of the idea after seeing many Marywood students struggle because they don’t have a vehicle on campus. The eleven-passenger van offers routes to the bowling alley, grocery stores, shopping malls, late night weekend pick ups and even NET Credit Union. The Marywood Shuttle runs multiple times a week, stopping at different stores and shops in the Scranton area. The shuttle even stops at NET Credit Union Headquarters on Mulberry Street. This stop allows students to access the ATM, make transactions and more banking opportunities. All Marywood students, employees, & staff are all eligible to join NET Credit Union. NET Credit Union donated $10,000 towards the shuttle. Seeing two current students work hard to make an idea come about to benefit all students is what made the decision to donate simple to NET Credit Union. Students can check the shuttle’s schedule here: marywood.edu/about/shuttle. Hats off to Kendall and Dimitri!